What’s the trendiest of all trendy phrase in education right now? You might say critical thinking or even Common Core, but we’re noticing another phenomenon: Deeper Learning. It’s a buzz that’s bubbling through the education world, but more important than the hype is what it really means. 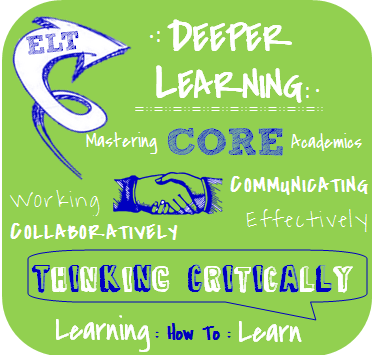 Here’s a quick look at deeper learning. Our increasingly complex world demands much of its students. In almost every aspect of their lives, young people as being asked to learn more, process more, and produce more. These increasing demands mirror the world around them. Now more than ever, the nation‘s education system is being challenged by a technology-driven global economy that requires a skilled and deeply literate workforce. be self-directed and able to incorporate feedback. Today, the push for deeper learning is being fueled in part through support from the William and Flora Hewlett Foundation which defines deeper learning as students applying what they have learned in one subject area to newly encountered situations in another. They can see how their classwork relates to real life. Pretty cool right? So the question is HOW, how do we provide students with experiences that will promote deeper learning? Well one way is to continue learning ourselves. Earlier this year High Tech High hosted a great MOOC on deeper learning. You can check out the syllabus and learn more about the course here. It is pushing us to be more thoughtful about when and how we scaffold; and when and how much time we give students to grapple; and when and how we step in and coach. Some of our discussions have simply been around the topic of how much wait-time we give our students before stepping in. Other discussions have gone far deeper and pushed us to choose text that would have once seemed way beyond our students reach. For example, our third grade team decided to use Brown v. Board of Education as the complex text in their democracy expedition. But most importantly, our conversations are turning to the skills and traits we need to explicitly teach our students so that they can confidently tackle a text like Brown v. Board of Education. Want to go deeper into deeper learning and see the shift in action? Check out this video series and let us know what you think.